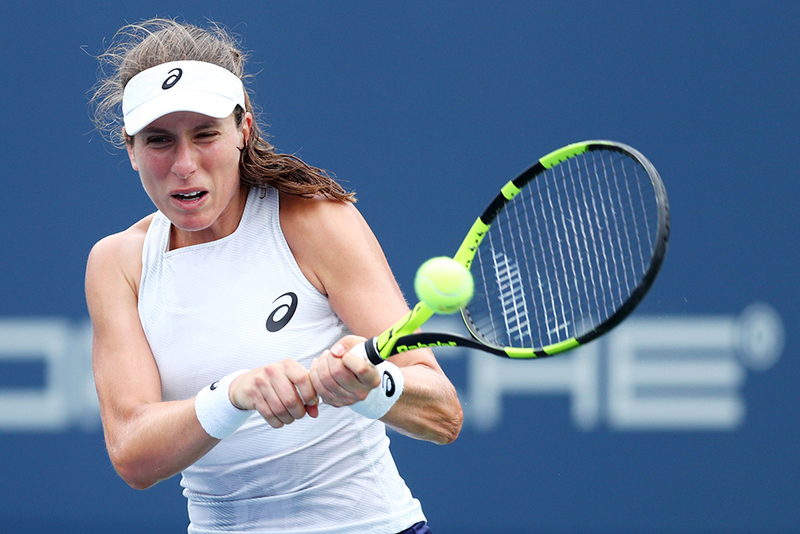 Noew York: Johanna Konta, struck down by a heavy virus only a week ago, still sounds as if she would be better off watching the US Open on TV than playing the sixth seed, Caroline Garcia, in the first round on Tuesday but she insists she is fit to be a contender. Konta beat her in the fourth round during her wonderful Wimbledon run in 2017, having lost to her in three tough sets at Indian Wells that year, and leads their rivalry 3-2. It has been hard to gauge Konta’s game this year, as good performances have not always been rewarded with victory, and some of her losses have been against the game’s best players — including Elina Svitolina, twice, Angelique Kerber, Caroline Wozniacki, Petra Kvitova, Ashleigh Barty, Venus Williams and Jelena Ostapenko. But she also in the first round of the French Open and had shock setbacks against Fanny Stollar (219), Bernarda Pera (123) and Marketa Vondrousova (54). Then came what should have been a kick-starter win to end them all: 6-0, 6-1 against Serena Williams in the first round in San Jose a month ago. It was the heaviest defeat of the American’s career but Konta’s victory was somewhat diluted when Williams later revealed she had learned 10 minutes before the match that the killer of her half-sister in 2003 had just been released from prison. As she correctly pointed out, she can only take care of what happens on her side of the court. The only stage she could meet Serena again in this tournament would be in the final and the path there for both of them looks equally challenging. If there is to be a new champion, it is not inconceivable that it could be Aryna Sabalenka, the emotional 20-year-old Belarusian who beat Konta in the first round in Cincinnati this month and lit up Connecticut on Saturday when she won her first WTA title by outclassing Carla Suarez Navarro. That followed fine recent wins against Wozniacki, Karolina Pliskova and Julia Gorges. All of a sudden the women’s game is alive with talk of the next rising star. Sabalenka, who serves and hits off the ground with awesome power, enters a main draw here for the first time, seeded 26. She starts against the American Danielle Collins on Tuesday and could play Kvitova in the fourth round. While Konta’s progress has stuttered, Heather Watson’s season has brightened up considerably in recent weeks. She reached the final in Vancouver and the first round at Flushing Meadows after a fine run in the qualifying tournament. “I’ve been focusing on myself and being happy. I’ve been doing a lot of things off the court at tournaments such as sightseeing. It has kept me fresh rather than just practising and then going to bed.